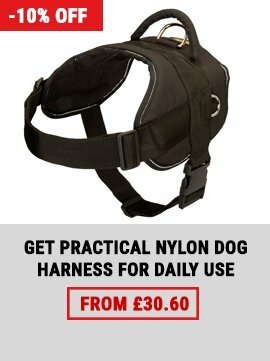 Which Dog Harness for Bikejoring to Choose? Bikejoring is a great training for your active dog and you. The dog needs a specialized harness for bikejoring to make this sport safe for your pet. 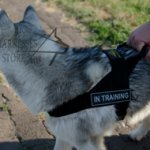 The harness should be made by professionals because your dog's safety is the most important point for successful and harmless activity. 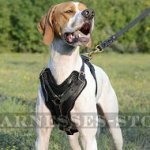 There are 2 of the best harnesses for this purpose, which are produced by experts. 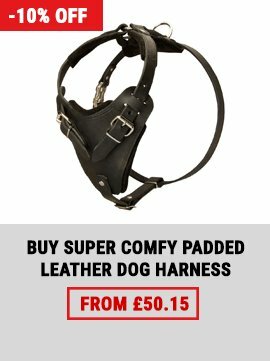 This leather harness is intended for strong and powerful dogs. Genuine leather of the highest quality was used for the harness. It is natural and safe for dog health. 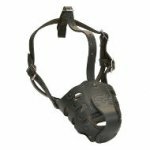 Neck straps are of 2 leather layers for double strength and durability. They are reliably stitched together. 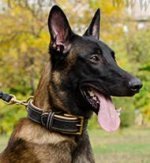 Leather straps are adjustable in 4 ways to fit the harness to your dog perfectly. 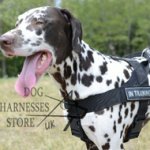 The harness is intended not only for bikejoring, but also for dog sport, tracking and long walks. 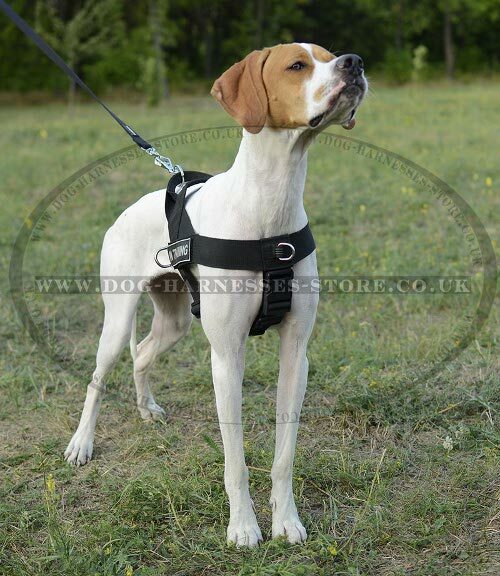 Anatomical construction of this harness follows dog body contours and doesn't restrict movements. It won't rub dog's skin and won't hurt your pet. Back plate is padded with thick and soft felt for additional comfort. 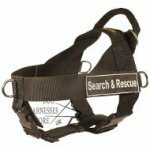 Light weight is an essential advantage of this harness. Your dog almost doesn't feel it. This is very important for comfortable outdoor activities. The harness is extremely durable at the same time. These qualities are provided by selected leather. The harness is equipped with brass hardware. Brass is solid, resistant to corrosion and luxury looking. Classic buckles are to adjust the harness, quick-release one - to put it on and off easily. There is welded D-ring on the back plate for leash fastening. 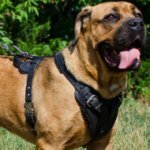 This harness will resist power of the strongest dog and will be maximum comfortable for your pet! The other one harness, which is ideally suitable for bikejoring, is of nylon. It is high-tech equipment for healthy exercising. 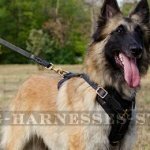 The harness is a multifunctional outfit that is used also for tracking, training, pulling and walking. 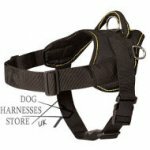 This ultimate harness is used in any weather because nylon is wet and waterproof. Stretch and wear-resistance, light weight and extra durability are the other advantages of nylon. The harness is easy to adjust with the help of girth and under belly straps. 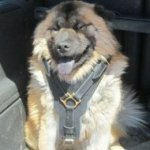 They are used to fit the harness to the dog and quick-release buckle is to put the gear on easily. There is also an under belly strap for better harness fitting. It is removable and you can take it off with quick-detach buckle. Buckles are of strong plastic and rings - of nickel-plated steel. There are 4 of them. Side D-rings are for cargo attachment. The harness is also for muscles development and sledding due to these rings. 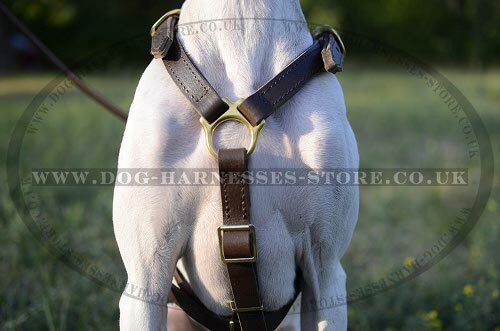 Front D-ring on the chest strap is to stop pulling on the leash to provide additional safety. The dog will be guided towards you when it pulls on the lead. This is natural and gentle way to get rid of such a bad habit. 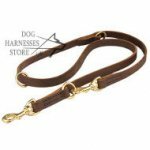 When the leash is attached to the chest ring, this prevents pressure on the dog's neck and throat. Loosing O-ring on the handle is also for lead fastening. All the rings are welded and rust and break-resistant. Upper handle gives you more control over the dog. It is reliable and convenient to hold. There are also sign patches with Velcro on both sides. You can identify your dog's activity with them. Choose a set among the variety of patches of get black ones and write anything yourself. 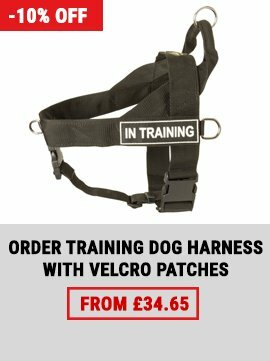 This harness will become an indispensible outfit for your dog's daily outings!